The European Food Safety Authority (EFSA) has published a new scientific report on the current status of the spread of African swine fever (ASF) within the EU. The report describes, among other things, which management measures EU member states should take if an isolated outbreak of the virus infection occurs, i.e. if it is detected far away from the current spread. The scientific basis for these recommendations comes from a modelling team based at the Helmholtz Centre for Environmental Research (UFZ) in Leipzig. Compared with the previous year, African swine fever has spread further. Hans-Hermann Thulke and his team model how African swine fever is spreading. They thus provide European authorities with an important basis for decision-making. Compared with the previous year, African swine fever has continued to spread. New outbreaks far from the actual centre of the epidemic in north-eastern Europe have been recorded in Romania and Bulgaria. 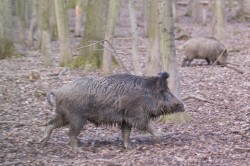 And even in Belgium, just 60 kilometres from the German border, numerous dead wild boars have been found. It is clear that the virus has found its way into Belgium by humans and not by wild boars movements or free-range domestic pigs. There is great concern in the EU that African swine fever may occur suddenly everywhere, thereby having a significant economic impact. 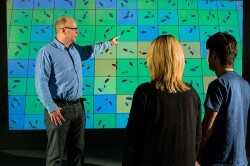 The UFZ modelling team led by Dr Hans-Hermann Thulke was therefore commissioned by the European Food Safety Authority (EFSA) to investigate three different baseline scenarios and evaluate current management measures: Firstly, ASF-free areas located far away from the current centre of the epidemic. Secondly, areas still free of ASF but located close to ASF-infected areas and at higher infection risk due to wild boars. Thirdly, those areas where the virus suddenly occurs as an isolated case located far away from the current ASF epidemic requiring immediate action. The third scenario - isolated cases of African swine fever - is currently of particular public interest and therefore in the focus of the UFZ modellers. "The challenge is the impossibility to predict when, where and to what extent swine fever will occur," says Hans-Hermann Thulke. In response to an isolated ASF case in wild boar, the EFSA proposes three surrounding management zones: The central core zone is fenced to hinder wild boars from leaving the innermost zone and people from entering it. The core zone is encircled by the buffer zone, which itself is enclosed by an even larger intensive hunting zone, in which hunters should actively chase wild boars. The UFZ researchers simulated different scenarios by varying strategy parameters e.g. the size of the management zones, the hunting intensity, the proportion of dead wild boars that is removed, the permeability of the protective fence or the likelihood of carcasses being discovered. The model results were used to assess which control measures would be most likely prevent further spread of ASF. The model outcome reveals the importance of fast collection and disposal of dead wild boars considering strict biosafety conditions to control virus spread. This is reasonable since healthy wild boars may acquire infection by close contact to the carcass of an animal succumbed to ASF. For example, if 20% of the dead wild boars are removed, the probability of successfully controlling virus spread was 80% given that also wild boars are intensively shot in the hunting zone. By establishing the central core and buffer zone, valuable time can be gained to preventively decimate the wild boar population in the surrounding hunting zone before ASF spread will expand beyond the buffer zone. Furthermore, the faster wild boar carcasses are removed from the central zone, the greater the chances of success. Further to the example above, if twice as many carcasses - i.e. 40% - could be removed promptly, the chances of success would be equally high but without the need for intensive hunting. However, the management considerations to fight African swine fever only make sense in the event of isolated cases. "If the virus has already spread over a large area and long borders need to be protected, our simulation showed that the focal control approach is no longer effective," says Dr Thulke. This matches the practical experience that the continued spread of the disease can hardly be prevented once it has become established. "In this respect, I see the consistent implementation of measures for isolated cases as a chance that should not be squandered," explains Dr Thulke. The recent analyses built on the UFZ’s 20 years of experience of modelling to support animal health decisions regarding combat of rabies, foot-and-mouth disease and ASF. According to the UFZ researcher, Germany and other EU member states could draw key conclusions from the EFSA’s scientific report. "Based on the report, the regional disease management could very well prepare contingency plans for a possible isolated outbreak of African swine fever," explains Dr Thulke. At what point should the authorities intervene? What type of fence is necessary for the central zone? Whom to involve in shooting the wild boars? Where will the carcasses be disposed of? These are questions for which each federal state should have concrete answers based on the EFSA report. "Federal states therefore have an opportunity to add more detail to existing emergency plans and to base them on resources," says Dr Thulke. The EFSA provides the European Commission, the European Parliament and EU member states with scientific advice about food safety. Every year it publishes a report on ASF for the European Commission, which not only reflects the current epidemiological situation of ASF in EU member states, but also addresses specific issues.